A relatively “new” Grossmont High School sport is volleyball. 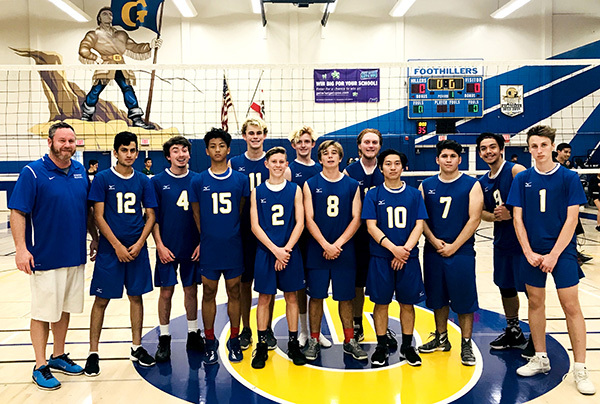 Since the first volleyball team “took the court” in 1972, Grossmont students have enjoyed the challenges and the excitement of volleyball. In 1972, teacher Alice Bardon coached the first Foothiller volleyball team, which was a coed intramural team. The following year in 1973, the first entirely girls volleyball team appeared. Over the next 45 years, the teams won 12 league championships and in 1987 were CIF champions. The 1977 team won Grossmont’s first league championship. That year, Peggy Adams and Robin Miller were Grossmont League Co-Players of the Year. Today Peggy Adams Breslin, recalls, “Volleyball was a great experience at Grossmont during my four years. Making the varsity team as a freshman was good because it was the first year the girl teams had CIF. It was great playing with the older more experienced players. Highlights for me were winning league in 1976 and 1977 and beating La Jolla and Patrick Henry in CIF. The 2017 team also earned the honor of being the Volleyball All-Academic Team for the East Region of San Diego CIF with a GPA of 3.56, and Emily Barnes earned the Section Scholar Award for volleyball with a GPA of 4.8. Grossmont’s first boys team, the 1991 Boys Volleyball team, won the first of 19 Foothiller league championships. From 1991–1997 the boys teams won seven straight league championships with the 1995 team winning CIF; from 2001-2006 the teams won six straight league championships. Teacher Sara Whitehouse Ortiz coached the boys from 2007–2015. From 2008–2013, her teams won six consecutive league championships, had players named as league MVP for seven consecutive years (2007–2013), and were Division II CIF runner-ups in 2010. All of those nine years, the teams were named San Diego Union Tribune All-Academic teams. In 2014, the team was recognized as having the highest team GPA in San Diego County. For the first time in the program’s history, the team was able to run a novice program, a team for freshmen, and fielded a Beach Volleyball team from 2012-2017. Several of the players continued to play volleyball at the college level, many on scholarships, and former player Jake Haar is currently coaching volleyball at Doane University in Nebraska. Last year’s boys team won the 2017 Grossmont Hills League title. Seniors Nino Haegen, Eddie Solis, and Tyler Foster were awarded All League honors. Volleyball is one of the 25 Foothiller athletic teams which challenge students to develop their potential and their character beyond the school day. Thanks to the 97 years of dedicated coaching, students leave Grossmont having learned more about commitment, discipline, and aspiration. With engineering being emphasized in education, Grossmont High School in La Mesa, California, is participating in Project Lead the Way’s engineering nationwide STEM program. Students in Jeffrey Lee’s engineering pathway at Grossmont High School are focusing on career and career readiness that meet industry standards including communication, collaborative, technical, and innovative skills. An element of this program is for students to enter competitions that allows them to showcase science, mathematics, and engineering concepts through innovative designs that relate to relevant problems in society. Representing young women in engineering, Jessica and Jamie Medlin, twin sisters in their junior year at Grossmont High School, teamed up with fellow classmate Tanner Askey, also a junior, to make up the Grossmont Foothillers’ Engineering Team. The team, in their second year of a three-year engineering program, competed in the Project Lead the Way Southern California, Chevron Design Challenge at Santana High School on Saturday, April 14. Through a six-step engineering design process, the Foothiller Engineering Team collaborated to create a storage organizer for many uses and purposes. This included creating technical sketches of designs that meet design constraints, CAD (computer aided designs), and professional presentations to a panel of five engineers that are currently working in the field. These aspiring and dedicated GHS engineering students placed third out of 17 southern California regional teams. 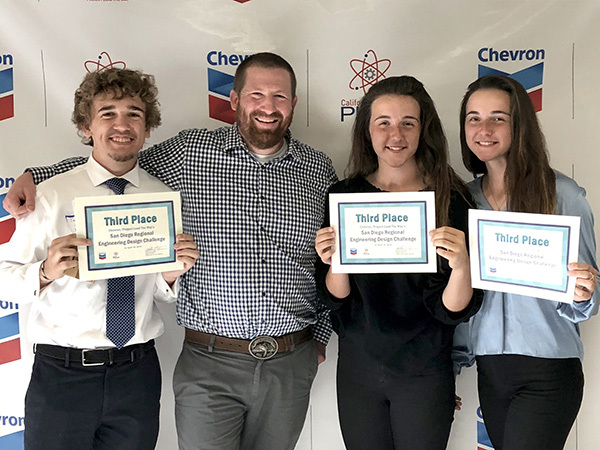 The top three teams at each of the California’s Regional Chevron Design Challenges advance to the state finals competition in Pleasanton, California, on Saturday, May 5, 2018. The Foothillers’ Engineering Team is honored to compete and represent the Grossmont High School Engineering Program in this prestigious competition. — Connie and Lynn Baer write on behalf of the Grossmont High School Museum. To discover more about Grossmont’s history, visit foothillermuseum.com or visit the GHS Museum Wednesday, May 2, noon–3:30 p.m. or by appointment. Contact: 619-668-6140 on Wednesdays or email ghsmuseum@guhsd.net.